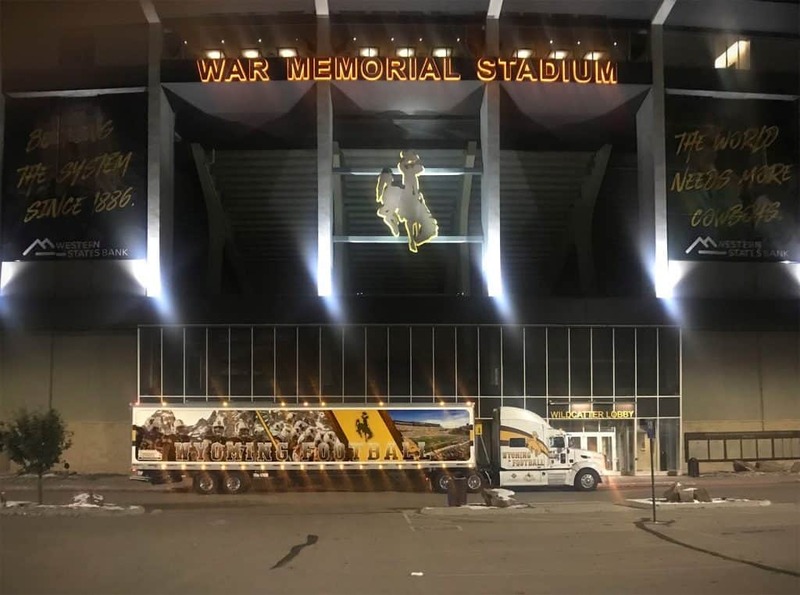 Arrow Moving and Storage Co., Inc. of Cheyenne, WY is proud to announce, for the 13th year in a row, we are the official moving and transportation company for University of Wyoming Football Department. Our trailer is pulled by a Peterbilt Model 387 tractor from Peterbilt of Wyoming and is wrapped in a design from Western Specialty Manufacturing Corporation of Cheyenne. Jonah Bank of Wyoming also partnered on the trailer. The trailer is 53 feet long and contains 4,100 cubic feet of space to haul Wyoming Football gear. It is a unique project to complete,” said Bill Miller of Western Specialty Manufacturing of Cheyenne, who created the design for the trailer. “It was fun working with Dan (Stinson, Equipment Manager for Cowboy Football) and the athletic department, sorting through photos and trying to find images that would work on the trailer. It was amazing. It took a little bit longer to get done than what we anticipated, but at any rate it was a fun project and a challenging one too. Stinson said that he and his staff will load approximately three dozen equipment trunks, including an estimated seven tons of player gear, staff apparel, coaches’ communications systems, sports medicine supplies, radio broadcast equipment and video equipment into the trailer for each road game. The new 53′ trailer also features a lift gate to assist with the loading process.